In 1917, Russia witnessed a series of catastrophic events which would change the course of the country’s history, forever. The acceleration of revolutionary activity continued to threaten the lives of the tsar, his family and the monarchy. The country was still at war with Germany, a war which had a devastating impact on Russia resulting in the loss of an estimated 1.8 million lives. The war took its toll on Russia as discontent grew, food became scarce, soldiers became war-weary, and the devastating defeats on the eastern front threatened the tsar’s leadership. The February Revolution was the first of two revolutions in Russia in 1917. It was centered on Petrograd, then the capital (now St. Petersburg), on March 8 (Women's Day). On March 15, 1917, Tsar Nicholas II was travelling by train bound for Tsarskoye Selo when he was stopped at Pskov. The Duma insisted that Nicholas abdicate, sending representatives Aleksandr Ivanovich Guchkov and Vasilii Vitalievich Shulgin to meet him there. Nicholas complied and signed the papers. Nicholas abdicates in favour of his brother, Grand Duke Michael Alexandrovich. The following day, on March 16, 1917 (March 3, 1917 old style), Grand Duke Michael ponders the situation briefly and then declines the offer. Russia is no longer a monarchy. Vladimir Lenin, exiled in neutral Switzerland, arrived in Petrograd from Zürich on 3 April 1917 O.S. He immediately began to undermine the provisional government. In July, Georgy Lvov was replaced by the Socialist Revolutionary minister Alexander Kerensky as head of the government. 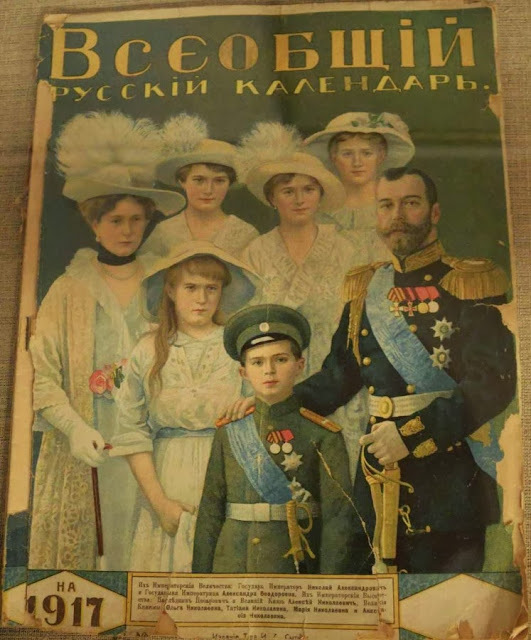 After months of being under house arrest in the Alexander Palace at Tsarskoye Selo, the Imperial family are exiled to Tobolsk, Siberia in August. The October Revolution, officially known as the Great October Socialist Revolution took place with an armed insurrection in Petrograd traditionally dated to 25 October 1917 (by the Julian or Old Style calendar, which corresponds to 7 November 1917 in the Gregorian or New Style calendar). Vladimir Lenin, a Russian communist revolutionary, politician and political theorist served as the leader of the Russian SFSR from 1917. On 20 December 1917 the Cheka was created by the decree of Vladimir Lenin. These were the beginnings of the Bolshevik's consolidation of power over their political opponents. The year 1917 was a major turning point for the history of Russia, and also the Russian Orthodox Church. According to Lenin, a communist regime cannot remain neutral on the question of religion but must show itself to be merciless towards it. There was no place for the church in Lenin's classless society. The assets of the Imperial family, as well as members of Russia’s aristocratic and noble families were nationalized. The Bolsheviks began the persecution, arrest and murder of thousands of innocent Russians. Lenin and the Bolsheviks set the stage for the Red Terror. Imperial Russia was no more.